I am in the middle of moving. Again. We are finally finishing the last bits of the renovation and starting to move our things to the new flat. As anyone who has renovated (or constructed for that matter) knows, this becomes an interminable phase which involves a million little things that you suddenly notice are unfinished or need to be changed — things which seem to multiply overnight! So that’s where I have been, and still am. Halfway packed with a new kitchen agonizingly near yet still so painfully out of reach. Near enough so I can almost taste it, but too far to actually do so. So cooking has been sporadic and not particularly inspired. Waking moments are filled with back-and-forths between the contractor, the interior designer, and us. Thank goodness we found a place that sells decent chocolate croissants or I don’t know what I’d do for sustenance! In preparation for the big (and final!) move, I’ve been trying to use up all the bits that have been hanging around my fridge and freezer. Despite all the hustle, and the awkward half packed state of affairs over here, and the odds-and-ends ingredients, this soup turned out to be a lovely by-product of the clean-out. I first took two roast chicken carcasses that I had tucked away in my freezer for future stock use, along with a bag full of random vegetable parts (broccoli trunks, the woody parts of asparagus, parsley stems, etc), and plopped them all in a pot with an onion, some bay leaf, black pepper, salt, and water. I let this simmer and reduce until I had a nice flavorful stock…which I then strained and set aside. I peeled and chopped another onion, the two last carrots in the crisper, and a lonely sweet potato — these I sautéed with a nice amount of butter in another pot. In went some generous shakes of cumin, a smidgen of cinnamon, a few twists of black pepper, and the stock. I cooked this until the vegetables were tender then took everything off the heat to puree the lot with a hand-held blender. At this point you should taste and adjust seasoning, as well as add more stock if the soup needs to be thinned out (or cook further if it is too thin). I topped mine with a dollop of Greek-style yogurt which I strongly recommend! Good luck with the final move and happy Easter to you too!! Happy Easter Joey. The soup is heavenly to me and nutritious enough for a full meal. I trust that your move to your new home would be smooth. That is such a comforting soup! Yummy. Good luck with the move and Happy Easter! Hi Manggy! Oh wow! Congratulations! Looks like I’ve missed a lot…going over to your site to update myself now 🙂 The heat is not pulling the punches for sure!!! Hi Divina! Happy Easter! I didn’t think about how nutritious this soup is until now! I suppose it really is 🙂 More reason to make it again! Hi Rosa! Thanks! I can’t wait until we are settled in the new place! Hi Joanie! That sounds good! Happy Easter! Congratulations on the move Jo. I know it is a bit of a hassle but once done I am sure that it will be great having a new kitchen to play around with. In the meantime, I'll just drool over the soup! Looks delicious. happy easter, Joey! This looks like a great fridge clean out soup. there's nothing more exciting than moving to a new place. Congrats! All the best for the move, Joey. I know how painful it can be!! Oooh, this looks delicious! 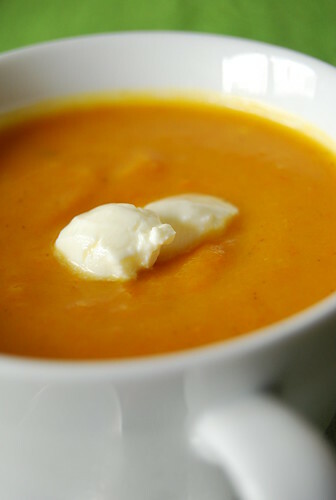 I can eat sweet potatoes and soup all year long, warm weather or not! Good luck, Joey! We did our 7th and final move a couple of years ago, so I know how eager you are to be done with the packing and relaxing in your fully furnished house! I hope your move goes well and your new place is all you hope it to be! It's such a pretty soup! Happy Easter, Joey! Sometimes the best results come from random ingredients that lurk in your fridge and pantry… Carrot and sweet potato sounds wonderful to me! Hi Anne! Oh my…you certainly hit the nail on the head (no pun intended)…I will be so glad when we are finally settled in! Hi MM! So true! And yes, I was thinking about possible baby food version of this 🙂 Minus the salt too…poor things, haha! I must ask my pedia for a list of herbs and spices I can give the baby! Hi Veron! Thanks! I’m keeping my mind on the exciting bits! There is just so much to tie up! Hi Susan! You can imagine…gosh just the word relax has me sighing! Can’t wait! Hi Bron! Thank you! This soup really had me smitten…definitely repeating this! Hi Suzana! Very true…I love the challenge of using only what you have lurking around to make into something yummy! I love a little touch of cinnamon in savory dishes. Love your blog and I'm now following it – I look forward to reading it often! Looks good. It reminds me of butternut squash soup. My ultimate fav…. I know what you mean about suffering through moving. We've only just begun the process and i'm beat! This looks very yum! Hello Lonesome Road Studio! Thanks for stopping by and I’m glad you enjoyed my ramblings! Hey! Good luck with the move. The soup looks gorgeous. Yummy, indeed. And healthy! I love it! Cheers! The soup sounds wonderful Joey. Good luck with the move and a belated Happy Easter. Hi Barbara! Thank you! We are moved into the new flat but there is still a lot of unpacked boxes and stuff everywhere! And they haven't moved my internet yet so I still have to go to the old flat if I want to use it!!! Arf. Isn't it funny how things cobbled together with what you have suddenly make a great soup? I hope your kitchen is ready soon! This recipe sounds lovely. I'm sure this soup tastes as good as it looks. I discovered the miracle of the hand blender for puree-ing soups a while back – it's amazing how well it works. Hope your Easter move went well, and you're back to a fully stocked kitchen! I loveee carrot and sweet potato soup, but I mostly love the bright orange colour that makes everything around the table POP! And feels like I'm eating spring. Hi Vickys! Thanks for stopping by 🙂 Yes, gotta love that vibrant color! I can't wait to sit and read your recipes! I have added you to the Food Blog Roll on Midchix.com! Your link will appear in the “Mama Can Cook” Flock! Can’t wait to explore your site! It looks AMAZING! I love creating new recipes with the ingredients in my fridge…great job!